The Boston Bruins announced on Saturday that team captain Zdeno Chara suffered an injury to his MCL earlier this week and will be reevaluated in four weeks. 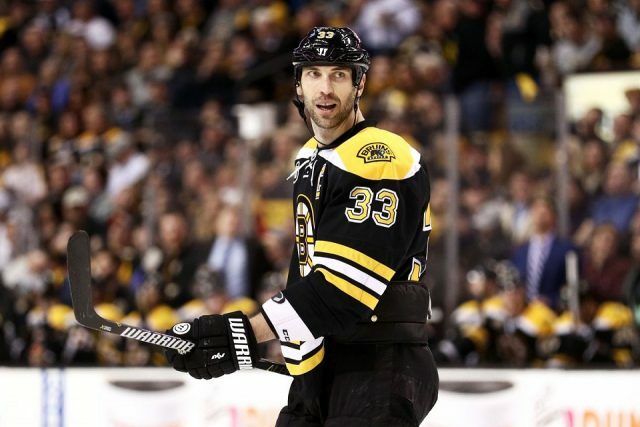 On Wednesday night in Colorado, Chara collided with former Bruin Carl Soderberg and twisted his knee awkwardly in the collision. He continued to skate afterward, showing little signs of pain, but went off the ice and into the dressing room. The Bruins later announced he would not return to the game that evening due to a lower-body injury. The following day, the organization announced that Chara traveled back to Boston, instead of continuing with the team on the road trip, to be re-evaluated by team doctors. Now the update on his status has been delivered, and it isn’t good news. The team captain will be re-evaluated in four weeks, and recovery is expected to be any time between then and six weeks from now. It is unlikely fans will see Chara for the rest of 2018. With any luck, he’ll be back in the lineup right in time for the Winter Classic game at Notre Dame against the Chicago Blackhawks on Jan. 1. The 41-year-old has been lucky as of late avoiding injuries the last few years but seemingly could not escape the injury bug that has been plaguing the Bruins for the last few weeks. Along with the news of fellow veteran and leader Patrice Bergeron returning to Boston for a re-evaluation on an upper-body injury after a nasty boarding injury against Dallas, the Bruins are running out of veteran blood, and, frankly, players. Half of the Bruins defensemen that started Saturday night in Arizona have played less than ten NHL career games. The only good news that could be taken from this is the fact that the Bruins may get better-rested players for the second half of the season. For Chara, at his age, this is especially important—he’s been debatably running out of energy as April approaches, which makes this injury possibly very well-timed indeed for the hockey club and for himself.